Biography: Harlan Zaback was born and raised in Caldwell, New Jersey, a suburban town twenty miles west of New York City. Mr. Zaback attended Rutgers University in New Jersey, graduating with a degree in History and minor in Political Science. After graduating from Rutgers, Mr. Zaback worked briefly in education, specifically as a teacher’s aide working one-on-one with non-verbal autistic children and with children who suffered from severe behavioral issues, before deciding to pursue a legal degree so he could better assist individuals with the most need for assistance in exercising their legal rights. This desire brought him to San Diego where he attended law school at California Western School of Law, where he earned his Juris Doctor degree. 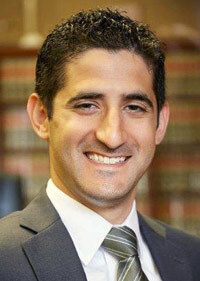 Both while attending law school at CWSL and as a post-bar law clerk, Mr. Zaback worked at Berman & Riedel, LLP, where he gained invaluable knowledge and experience into the firm’s concentrated practice by assisting the firm’s senior attorneys in various areas of civil litigation, particularly in personal injury and elder abuse and neglect related matters. Mr. Zaback thrived in his position and was hired as an Associate Attorney at Berman & Riedel, LLP, shortly after being admitted to the California State Bar in December 2009. Mr. Zaback now uses his knowledge, skills and experience to help the firm continue its reputation as being a leader in providing clients with successful representation in recovering damages as a result of the negligent, reckless and/or wrongful conduct of others. In addition to assisting clients of the firm, Mr. Zaback is an active member of his Condominium Association’s Board of Directors where he serves both as the Association’s treasurer as well as in the capacity as legal liaison to the Association’s independently retained law firm. In his free time Mr. Zaback enjoys running, hiking, playing golf, and fulfilling his interests for geography and history by traveling as much as he can. He is an avid fan of the New York Yankees and the San Diego Chargers. Associate Attorney, Berman & Riedel, LLP, 2010 – present.